Simple. Honest. Classic. Shaving foam lightly fragranced for sensitive skin. Instant lather spreads easily and rinses clean. 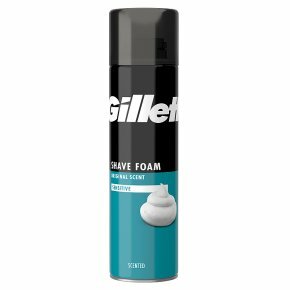 Rich lather reduces friction.Gillette Classic Sensitive Skin Men's Shaving Foam is lightly fragranced and provides a rich, creamy lather that spreads easily and rinses clean for that foamy shave men have enjoyed for generations. Use Gillette Classic Sensitive Skin Men's Shaving Foam with any Gillette razor.